Surely the most unusual telegram Winston Churchill received after being struck by a car while trying to cross Fifth Avenue, Manhattan, in December 1931, was from Oxford Physics professor Frederick A. Lindemann, known to all the Churchills as “the Prof,” a close friend and scientific advisor for more than three decades. Always ready to take advantage of life’s every experience, Churchill was no sooner up and about than he was drafting an article on his accident, selling it to the Daily Mail, and planning a convalescent trip to the Bahamas on the proceeds. When he asked for the scientific calculations, Lindemann was quick to oblige, with a certain touch of humor. Lindemann was born at Baden-Baden, Germany in 1886 to wealthy parents, an American mother and French Alsatian father who was a naturalized British subject. He forever regretted his Germanic upbringing. With a brilliant mind admired by such greats as Einstein, he received his doctorate in 1910 from the Physikalisch-Chemisches Institut in Berlin. He was still living in Germany at the outbreak of the First World War, when he made a hasty return to Britain. In 1915 Lindemann joined the Royal Aircraft Establishment, Farnborough, where he learned to fly. A fearless test-pilot, he successfully extricated an aircraft from an induced spin to establish the science behind the maneuver. In 1919 he was elected Professor of Experimental Philosophy at Oxford with responsibility for directing the Clarendon Laboratory, which he transformed from an outdated museum piece to a great modern facility. But his arrival at Oxford marked the decline of a career in which he had showed brilliance and achievement at Berlin and Farnborough. Thereafter his lethargy and the distraction of other interests limited his research in Physics. Although he kept rooms at Christ Church from 1922 until his death in 1957, the wealthy Lindemann was not a typical Oxford professor. He had a valet and maintained a chauffeur driven Rolls-Royce; he socialized with the aristocracy and leaders of industry and politics. In 1921 Lindemann was introduced to Churchill by the Duke of Westminster. They immediately became fast friends. On the surface, a non-smoking, teetotaling vegetarian who disliked publicity might seem an odd companion for the voluble Churchill, prominent consumer of cigars, alcohol, meat and attention. But the statesman was won over by Lindemann’s intellectual brilliance, charm, and amusing conversation. Lindemann, who had the gift of explaining complicated technical theories in brief layman’s terms, soon became Churchill’s unofficial scientific advisor. When Churchill was chancellor of the exchequer (1924-29), he often stayed with Winston and Clementine at 11 Downing Street. He also assisted Churchill in publishing the government newspaper, the British Gazette, during the General Strike of 1926. In contrast to many of her husband’s close friends, Clementine liked the Prof. It helped that they were both avid tennis players—she was a crack amateur, and Lindemann was probably the only person to have competed at Wimbledon while serving as an Oxford don. Moreover, they agreed on many important family matters, such as their shared belief that Churchill was spoiling his son Randolph while simultaneously raising impossibly high expectations for the boy. Clementine’s affection for Lindemann made it easier for him to be a regular guest at Chartwell, Churchill’s country home in Kent. His is the most frequent signature in the Chartwell Visitors Book. After a dinner, Churchill would insist that his friend break his abstinence and accept a tiny amount of carefully measured brandy. At Chartwell Churchill and the Prof often talked well into the small hours of the morning. Despite his diet that largely consisted of egg whites, Churchill’s daughter Mary remembered Lindemann as an “easy guest.” Such was Churchill’s faith in his friend that he made him a trustee of the trust established to make provisions for the Churchill family. Unlike Churchill, Lindemann never forgot or forgave a slight. 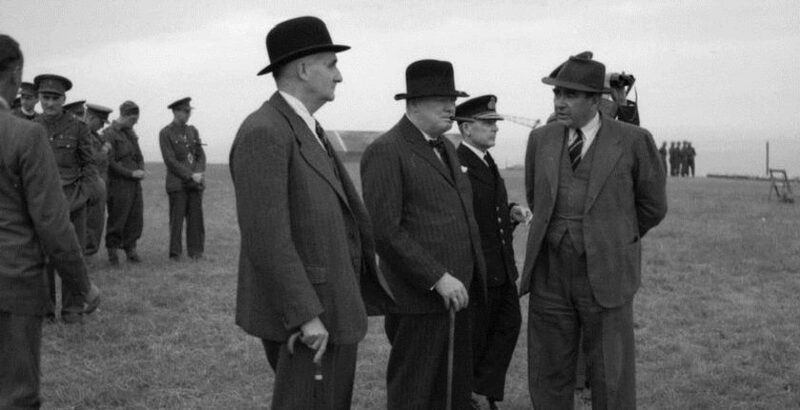 As Churchill’s longtime private secretary John Colville wrote, he was “a dedicated hater.” He knew nothing of people outside his social class, a snob who never hid his disdain for intellectual inferiors. His nursed a prejudice against Africans and was at times anti-Semitic. Nevertheless, after Hitler took power, he regularly helped German Jewish scientists to relocate to Britain, and found them places at Oxford and Cambridge. In the last year of his life he made a speech in the House of Lords condemning anti-Semitism. Lindemann foresaw the dangers of Nazi Germany and was alarmed about the deficiencies in Britain’s air defenses. He shared these concerns with Churchill and in 1935 he was appointed to the Tizard Committee, established in the late 1930s to study the needs of anti-aircraft warfare. He advanced several wild schemes, making no friends, though accusations that he opposed the development of radar are false. But his aggressive attitude, and tendency to report to Churchill behind the backs of his colleagues, created havoc. The committee was dissolved, only to be reconstituted without him a short time later. Within weeks of being reappointed as First Lord of the Admiralty in September 1939, Churchill appointed Lindemann his personal scientific advisor and head of a newly created statistics branch. Utterly loyal, the Prof continued in that role when Churchill became prime minister in May 1940. Despite its small staff, Lindemann’s branch studied all scientific and non-scientific matters save actual military operations. It maintained contacts with all government ministries, rendering a great corpus of government statistics into a simple and digestible form, often presented with illustrative charts. Subjects studied ranged from weapons production to beer rationing to food imports and shipping. With his access to the prime minister, Lindemann played a vital, influential, and powerful role in the government. Seeing Churchill almost daily, and often joining him for weekends at Chequers, the PM’s official country residence, he was probably closer to Churchill than anyone except Clementine during the war years. In 1940 Lindemann accurately argued that the Air Ministry’s estimates for the number of German bombers was “grossly exaggerated,” and supported measures to “bend” the German wireless beam used in night bombing runs over England. He was also proven correct later on, when he downplayed the effectiveness of the British night bombing of Germany. This led to an improvement in Royal Air Force navigational devices. Lindemann, however, was not always correct. He overestimated the efficacy of area bombing of Germany, tried to delay the use of the “Window” device that confused German radar, and played down the threat of the V-2 rocket-bomb. In 1941, Lindemann was promoted to the peerage as Baron Cherwell. A year later he joined the cabinet as Paymaster-General. After the Conservative defeat and Churchill’s departure as prime minister in July 1945, he returned to Oxford. Only reluctantly was he persuaded to rejoin the cabinet when Churchill returned as prime minister in 1951. There, he successfully supported the creation of an independent British Atomic Energy Authority. In 1956 he was elevated to Viscount Cherwell of Oxford. In 1953 his two-year leave from Oxford expired, and Lindemann returned to the university. He remained close to Churchill and joined the former prime minister on a trip to Sicily in 1955, advocating a British technical institution comparable to the Massachusetts Institute of Technology. His urgings led to the raising of funds that established Churchill College, Cambridge. Lindemann died on 3 July 1957 in his rooms at Christ Church, Oxford, aged only 71. Churchill, eleven years his senior, travelled to Oxford for the funeral. When it was suggested that he should rest following the service before making the return journey to Chartwell, Sir Winston protested: “But I must go to the grave. I must go the grave.” Indeed he did, walking in the procession to the graveside of one of his dearest friends. 1 Martin Gilbert, ed., The Churchill Documents, vol. 12, The Wilderness Years 1929-1935 (Hillsdale College Press, 2009), 387.